Very solid album with a cool sound and a great vocalist. A couple of really good tracks here which kind of showed the greatness to come on Mine Is Yours. 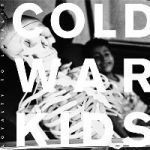 I can only admit to having no more than a passing interest in Cold War Kids over the years, so getting into an album of this was going to be a step into the unknown to some extent. But they are far more interesting than I had previously thought, possibly because now that I've heard a full album, I have a bit more context when hearing individual songs. As for this album, 'Something Is Not Right With Me' (or shall I say, 'SOMETHING IS NOT RIGHT WITH ME') is such a standout. Quite a cool listen.